Children’s experiences in school have a tremendous impact on their success. Daryel Garrison has seen this first-hand. He is the Kidzone program specialist for the Kansas City, Kansas Public Schools. Kidzone provides academic enrichment, youth development, fine arts and recreational activities before and after school, operating in six elementary schools and one middle school. 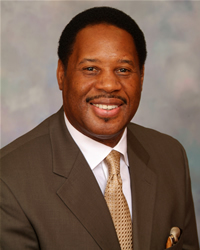 Garrison came to the district after a career of nearly 17 years with the Federal Bureau of Prisons as an education director. After managing the education/recreational programs in the prison system, he decided to take a proactive stance. Growing up in the 1960s was challenging, Garrison said. It was a time of confusion for African-Americans. But the strength of his family and church and the pride that was instilled in him by his teachers, and his high school coach, Craig Hall, at Sumner High School, gave him reasons to believe. His teachers and mentors helped him to develop the work ethics and the “can do” attitude it took to become successful. He earned a scholarship to play basketball at Southwest Missouri State University where he became an All-American and a Hall of Fame inductee. Garrison went on to play professional basketball in Brugge, Belgium for two years. Along with a K-12 teaching license, Garrison has a bachelor’s degree in recreation and a master’s degree in adult occupational and continuing education. In 2006 he received a Volunteer of the Year Award from the United Way.